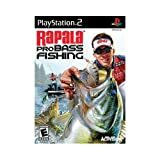 Activision Rapala Pro Bass Fishing 2010. Return Period (Days):10. Manufacturer Warranty:30 DAYS. Entertainment – Complete Product – Standard – Retail – PlayStation 2.